This has to be one of the easiest thing to do if you are short of time. How complicated or easy it is depends on how fussy you are about the ingredients. I will tell you the various possible options. As for the quantity of ingredients to use, since this is really a toss-together kind of dish, it really depends on your preference. Hence, I will just give estimates and leave you to decide the actual amount to use. This may not look like a normal recipe and may seem daunting because it is wordy, but trust me, it is easy. – Cook normally, like how you would do so for a normal meal. E.g. if you normally cook 2 cups of rice for a meal, then do the same for this dish. For those of you who are not very clear about how much rice to cook, in general, for my family, I cook 1.5 cups of rice for 2 adults and 3 young children. Again, this is an estimate because if your children are teenagers, you probably will need more. If you are big eaters, you will also need more. – If you don’t want rice, you can also use cooked pasta. Use small ones, like small elbows or ziti but not the strand type like spaghetti. – Normally I prefer to use my own homemade pasta sauce, which I make in big batches at one go. You can use bottled sauce from the supermarket. Whether it is cream sauce or tomato based sauce is up to your preference. You can also be creative about it and use other kind of sauces, such as teriyaki sauce or curry sauce. – Get ready-to-use ones to save time. One option is to go to Cold Storage and get ready-roasted chicken or chicken steak. If you buy a whole roast chicken, you have to cut out the meat for use in this dish. I prefer to buy roasted chicken steak. All I have to do is to use a pair of kitchen shears to cut them into little bite size pieces and mix them into the rice. – Alternative meat options include getting Chinese roast meat from your neighbourhood roast stall. Another option is to use cold cuts like ham or sausages. If you have some leftover meat from previous meals, e.g. Christmas turkey, you can also use it. – If you have time, you can roast your own chicken. Rub some seasoning and herbs on a piece of chicken breast or deboned chicken thigh, shove it into the oven to grill until cooked through, take it out, cut and use. – you can go meatless if you want. It is perfectly fine. – Buy ready shredded ones from the supermarkets. – Actually, if you use commercial pasta sauce, you don’t even need to season. – I don’t really list veggies as part of the ingredient list because veggies are already incorporated into my homemade pasta sauce. Depending on which brand of commercial pasta sauce you buy, you may or may not have veggies in your sauce. If you intend to include some veggies, onion and zucchini are two good ones to use. Peppers are also great. However, you will need to fry them up first before tossing into the rice. If you don’t want to go through that trouble, I would suggest using frozen peas and corn because they are small and easily cooked in the rice when you bake it. 1. Preheat your oven at about 200 deg Celsius. 2. Mix your cooked rice/pasta with your meat, veggies and sauce. Season if necessary. 3. Place the mixture in an oven-proof pan or dish. Try not to use one that is too deep. 4. 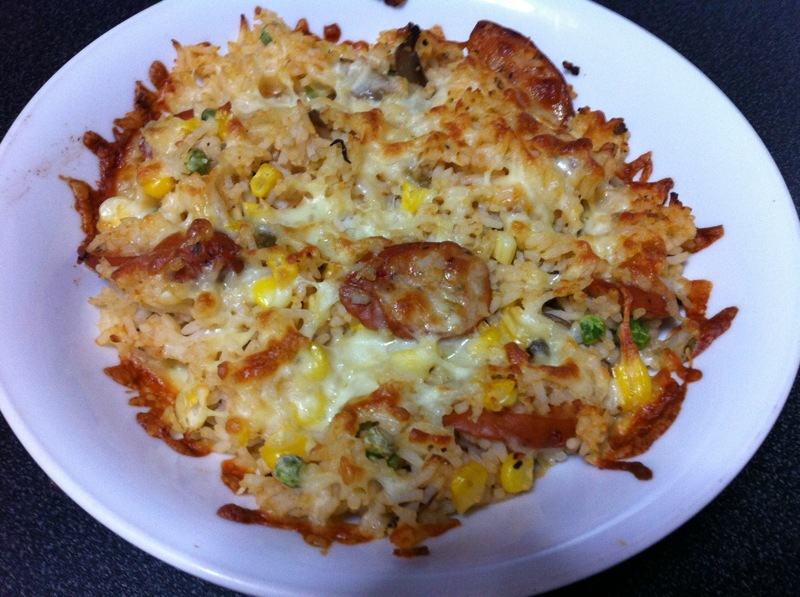 Spread shredded mozarella cheese all over the top of the rice mixture. 5. Place in the oven and bake until cheese is melted and starts to brown. This can be done within 30 minutes if rice is already cooked beforehand.